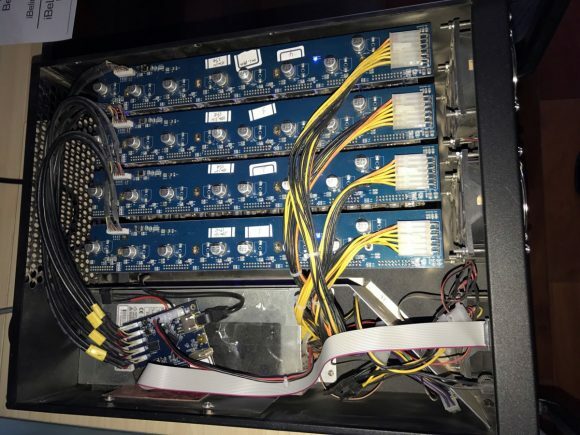 Looking at the official specifications of the iBeLink DM384M X11 ASIC miner state that the device should be capable of 384 MHS X11 hashrate (plus/minus 10 percent) with a power consumption of 715W measured at the wall with 25 degrees Celsius ambient temperature. This should be the numbers for the default configuration, however we did some measurements ourselves in order to get more accurate results in order to be able to do better calculations about the cost of operating the device. We have already measured on NiceHash an average hashrate that is slughtly above the official number of 384 MHS, so this is good, but what about the actual power usage and more importantly noise level. In our first impressions from the device we already mentioned that it is pretty noisy and not suitable for use in room where people will be present, but let us see what is the exact noise level as well. 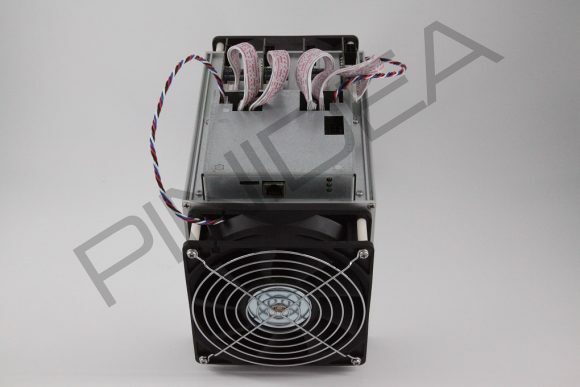 The power supply built into the miner is an 850 Watts server grade one that is compatible with 100-240V range (for worldwide use). The exact model is ASPOWER U2A-A20850-D and according to the official specifications is it rated as 80 Plus Silver, so a high efficiency solution. 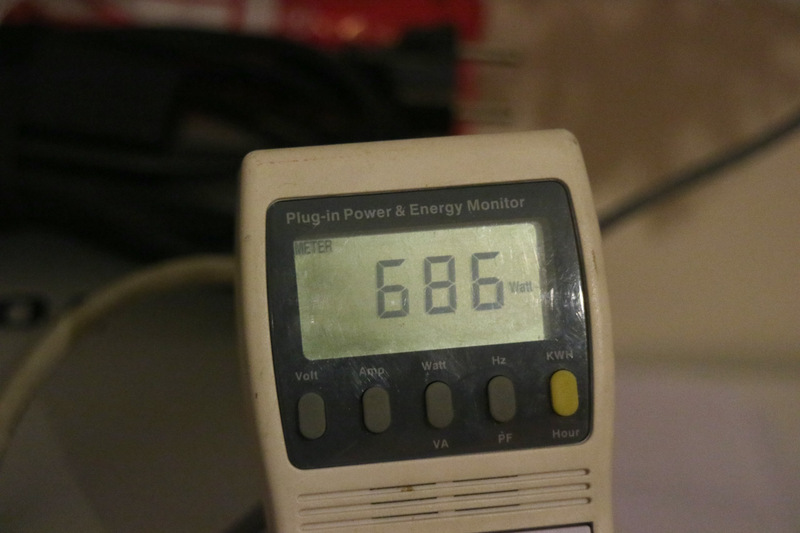 At stock settings (110 MHz PLL) the power usage we have measured on the wall with 230V EU power input was 686 Watts as you can see on the photo, the power usage in Watts might be slightly higher in US and other 110-120V countries due to slightly lower power efficiency. Increasing the operating frequency with +1 MHz steps is resulting in the power usage going up with about 5-6W on each step, so the 850W capacity of the PSU should be able to take up some nice extra overclock if the chips are capable of working well when overclocked and cooled well. We are going to be doing more extensive testing about the overclocking potential with results on the power usage and performance changes, working temperatures and cooling very soon. 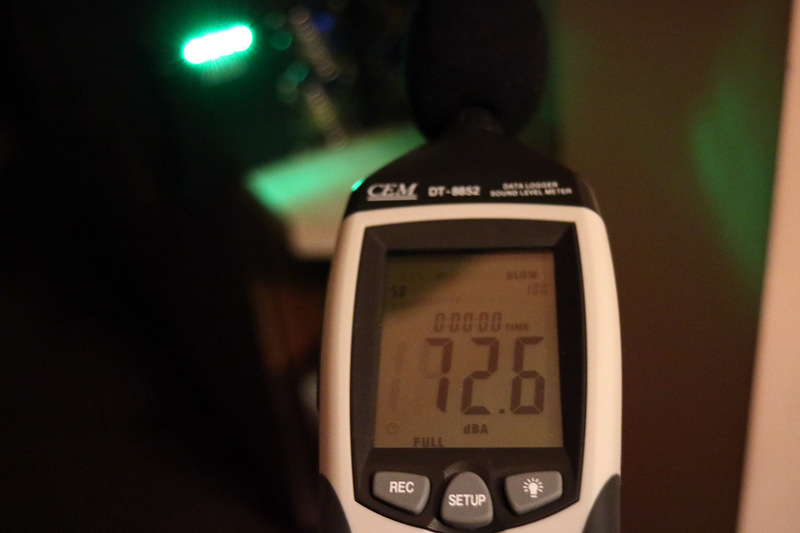 Now for the noise level, as already mentioned it is pretty high… just like from a rackmountable server for example. 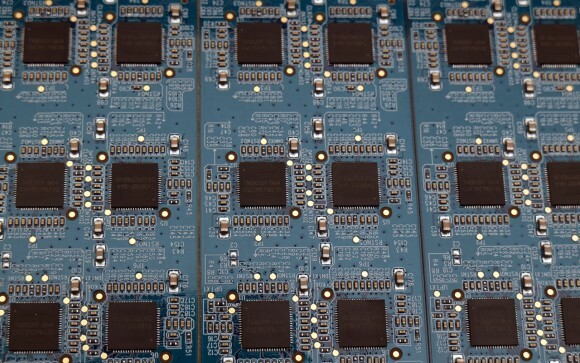 With a measurement showing about 72.6 dBA average it is perfect to be installed in a data center or a dedicated mining room, but it is not suitable for home miners as the noise level is too much for people to be in the same room for more than a few minutes… and even in the next room it might be quite noisy. The reason for the high level of noise is that the unit uses server grade fans by Delta Electronics and they are set to run at maximum RPM all the time (no temperature control). The same goes for the fan used in the power supply, a powerful Delta Electronics fan running at maximum RPM all the time, even though the PSU is highly efficient and there is not so much heat generated. The good thing about this default fans setup is that even at not that good conditions such as high ambient temperature the miner should be able to operate without any issues at optimum level. The not so good part is that small miners might have issues with the high level of noise and would probably want to do something to make it less noisy without compromising performance – this is possible with some modifications and we are already working on a solution to optimize the cooling, so more on that will be coming soon as well.